If you are living in Vancouver or if you are just visiting, you certainly must have noticed the smoke surrounding the city.Metro Vancouver has been affected during the last couple of weeks by a huge wildfires in British Columbia. The famous lakes, hiking trails and natural attractions are not being recommended due to the bad air quality. 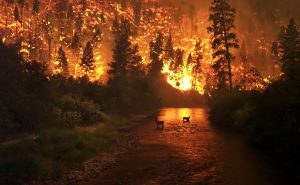 The province of British Columbia has been facing the worst fire season in 6 decades and remains under a state of emergency. More than 7 thousand people are in alert to leave their homes. Due to the dry and hot weather, the situation is getting worse everyday. The summer season usually is the happiest season of the year for Canadians. Summer means parties, camping, stars and bonfires. This year, more that a half of the wildfires have been caused by humans. According to Chief information officer Kevin Skrepnek, almost 5000 square kilometers have been burned across the province to date. butts, campfires, hot exhaust pipes coming into contact with dry grass and vegetation, power tools (such as chainsaws), Tiki torches and even discarded glass can all ignite a wildfire. It is important to exercise caution when in the outdoors, not only when enjoying a campfire or off-roading in the backcountry, but also in using tools and handling, storing and disposing of materials and fuels. Completely extinguish your campfire before you go to sleep or leave the area for any period of time. To extinguish your campfire, pour plenty of water on the fire and surrounding area, dousing the site of the campfire thoroughly. Stir the campfire until there are no embers and the ashes are cold to the touch. Do not discard smoking materials from vehicles. Always use interior ashtrays. Motorized vehicles, particularly All-Terrain Vehicles (ATVs) and dirt bikes, can produce a significant amount of heat from their exhaust systems. This heat can be enough to spark a wildfire. Avoid operating any motorized vehicle in tall grass and vegetation when the weather is hot and dry. ent. These prohibitions are put in on a regional basis, and affect all Crown and private land not under the jurisdiction of a local authority (such as a municipality or First Nation). For details of the current fire bans and restrictions in the province see the Fire Bans and Restrictions page. If you are within the jurisdiction of a fire department or local authority, contact them before having any manner of open fire (including fireworks, etc.). Report wildfires and columns of smoke to 1-800-663-5555 or *5555 from a cell phone.